AT the age of twenty-five, Porphyry, a rich citizen of Thessalonica, left the world for one of the great religious houses in the desert of Sceté. Here he remained five years, and then, finding himself drawn to a more solitary life, passed into Palestine, where he spent a similar period in the severest penance, till ill health obliged him to moderate his austerities. Thereafter he made his home in Jerusalem, and in spite of his ailments visited the Holy Places every day; thinking, says his biographer, so little of his sickness that he seemed to be afflicted in another body, and not his own. About this time God put it into his heart to sell all he had and give to the poor, and then in reward of the sacrifice restored him by a miracle to perfect health. In 393 he was ordained priest and intrusted with the careof the relics of the true cross; three years later, in spite of all the resistance his humility could make, he was consecrated Bishop of Gaza. That city was a hotbed of paganism, and Porphyry found in it an ample scope for his apostolic zeal. His labors and the miracles which attended them effected the conversion of many; and an imperial edict for the destruction of the pagan temples, obtained through the influence of St. John Chrysostom, greatly strengthened his hands. When St. Porphyry first went to Gaza, he found there one temple more splendid than the rest, in honor of the chief god. When the edict went forth to destroy all traces of heathen worship, St. Porphyry determined to put Satan to special shame where he had received special honor. A Christian church was built upon the site, and its approach was paved with the marbles of the heathen temple. Thus every worshiper of Jesus Christ trod the relics of idolatry and superstition underfoot each time he went to assist at the holy Mass. In 420, he went to his eternal reward, having lived to see his diocese cleared for the most part of idolatry. Reflection.—All superstitious searching into secret things is forbidden by the First Commandment, equally with the worship of any false god. 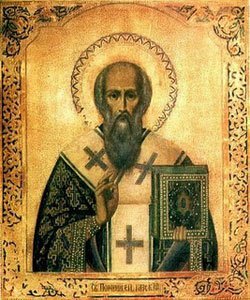 Let us ask St. Porphyry for a great zeal in keeping this commandment, lest we be led away, as so many are, by a curious and prying mind.